bl.uk > Online Gallery Home	> Online exhibitions	> Asia, Pacific and Africa Collections	> Bachhraj Ghat [Benares]. 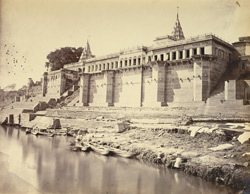 Photograph from the riverside looking towards the ghat and Jain temples overlooking the ghat from 'Views of Benares, from the River Side' taken by Brajo Gopal Bromochary in 1869. "Here the Jyns have lately built two temples, which stands upon the bank." This Ghat has two Jain temples. Varanasi, founded in the sixth century BC is one of the seven sacred cities of the Hindus but is also holy for the Jains. According to Jain traditions it is the birthplace of four tirthankaras and is counted among Jain sacred tirthas.